We appreciate your input here at Deckstainhelp.com as we continue to be your go-to source for the latest in deck restoration news and trending topics through 2019. See below for an article about Step 2 of the deck stain process, using a brightener, and why it is a key component to the deck stain project. Feel free to leave a comment below. Wood care and maintenance are the keys to having a long-lasting deck. Every year or two a deck should be cleaned and stained to protect the wood from the harsh elements. UV rays and unwanted moisture can wreak havoc on a deck that is unprotected. The number one reason a deck stain fails is due to the lack of proper wood preparation. Any exterior wood surface needs to be cleaned and prepped correctly in order for the stain to perform as expected. Failure to do so can lead to premature stain failure jeopardizing the wood’s integrity. To properly clean and prep a deck it starts with a wood cleaner. A sodium percarbonate based oxygenated cleaner is recommended. This type of wood cleaner has been proven to work the best in removing dirt, mold, mildew, wood graying, and in some cases an old failing sealer. It is highly important to remove all of these pollutants in order for the new stain to penetrate properly. Deckstainhelp.com remains committed to being your number one reference for deck restoration professional tips and industry news. For a beautifully stained wood deck that remains beautiful throughout the season and beyond, we strongly recommend a high-quality wood deck brightener following a cleaner or stripper. As always, we appreciate your input, so feel free to leave a comment below. Wood deck maintenance is important to the lifespan of any deck. Proper cleaning and staining are necessary on a regular basis to protect the deck from the harsh environment. Prior staining the surface needs a good cleaning. A clean surface will ensure proper adhesion and stain penetration. Cleaning a wood surface prior to staining will also enhance the beauty of the wood and give you a better end result. There are several necessary steps in the wood cleaning process to prepare the surface for a new coat of stain. The first step is to clean the wood with a quality wood cleaner to remove all the dirt, grime, mold, mildew, graying, and mill glaze. The aid of a deck cleaner will help break up and remove these contaminants that may prevent the new stain from performing. Most all quality deck cleaners contain caustic soaps that make cleaning a deck both easier and more effective. The downside to a caustic cleaner is that raises the pH level of the wood and makes it appear very dark in color. 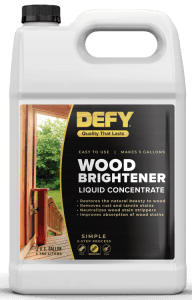 Let’s explore some reasons why this is not ideal if not dealt with and how using a deck brightener can restore the wood. We appreciate you visiting Deckstainhelp.com as we continue to be your go-to source for the latest in deck restoration news and trending topics through 2019. Below, we talk about Wood Brightening – Deck Brightening. Feel free to leave a comment below with any pictures you may have. The use of Deck Cleaners and Deck Stains Strippers when prepping wood for a coat of deck stain will cause the pH balance to increase. This is due to the mild caustics (bases) that the cleaners and strippers use, making the products more effective in the cleaning process. The side effect is that the pH is changed and will “darken” the natural wood color. The Deck Brightener (mild acids) will neutralize the caustic of the cleaner or stripper setting the pH balance to a neutral 6. 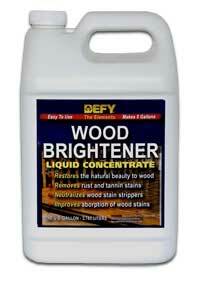 Using a deck brightener will increase the longevity of the stain as well. Wood Deck Brightening is a much needed and easiest step in the entire prepping process.